The Milwaukee County Historical Society will host a presentation of my Missing Milwaukee book this Thursday. I will talk about about some of the buildings in the book and show a slide show of various buildings. If you haven’t seen the presentation yet, this will be a perfect opportunity. Books will be available for sale after the presentation and I will be available to answer your questions! Where: The Historical Center, at 910 N. Old World Third Street in Downtown Milwaukee. 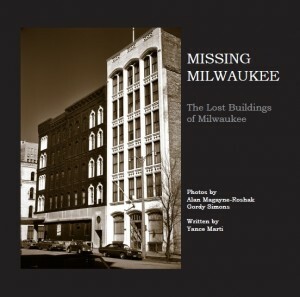 Here’s a great opportunity to take a walk into the past of Missing Milwaukee. This walking tour will be hosted by myself and will provide a glimpse back at several downtown buildings which are no longer with us. These buildings were featured in the HMI book published last year as well as many others. The tour will start at 5:30 on May 11th and is $15 for HMI members and $20 if you are not a member. For $10 extra you can get a copy of the book. More details and tour registration can be found here.